US ▼ 2011-05-24 $49.99 ? UK ▼ 2011-05-24 £29.99 ? EU ▼ 2011-05-24 €39.99 ? DE ▼ 2011-05-24 €39.99 ? AU ▼ 2011-05-24 $69.95 ? JP ▼ 2012-06-19 ¥? ? KR ▼ 2011-05-24 ₩? ? 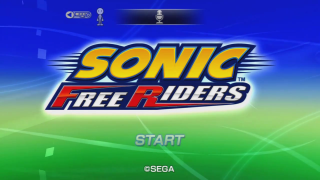 Sonic Free Riders (ソニック フリーライダーズ) is a Sonic game from the Sonic Riders franchise that was released exclusively for the Xbox 360 at the Kinect's launch in November 2010. It uses the Xbox 360's Kinect camera to track your movement, obviously like an air-boarder. Sega of America and Sega Europe described it as "an extreme fast-paced boarding game" designed specifically for Kinect's full-body controls. Race courses feature pick-ups and usable items on the course; players can use them and launch them at one another by "throwing, shaking or swinging" with their arms. 2.1 Marza Animation Planet Inc.
2.3 SEGA of America, Inc.
As with both of the previous Riders Titles, Super Sonic is unlocked by earning top rank on every mission and then using the Chaos Emeralds gear as Sonic. Super Sonic generally has no type (the Chaos Emeralds cannot equip Gear Parts), but he becomes a Power type upon Kick Dashing. Eggman retains his previous handicap of only using Bike gear, and now shares it with Vector. E-10000G also retains the handicap of only being able to use board gear. Additionally, E-10000G is not actually playable in the story mode. Instead an E-10000B is used in its place. The Avatar, Silver, and Blaze are entirely extra, and the latter two are unlocked by clearing the first four stories. Although both voice language tracks are included in the game disc, there is not a proper option to switch them in any regional version, and the game sets both the text and voice language by default according to the console settings language, with the Japanese voices defaulted to Japanese console language and the English voices to the rest of languages. Therefore, the only way to have the Japanese voices is by changing the Xbox Dashboard language to Japanese in order to set the game entirely in Japanese. In Cooperation With: O-TWO inc., xeen, Inc., FUN UNIT inc. This page was last edited on 9 April 2019, at 18:34.